Life totally took over the past two weeks. I actually took a week off from my training schedule last week. I did no formal exercise whatsoever for one week. It was a very difficult decision but something had to give. I worked extra, Carlos was on school vacation last week, we had play dates, I had a hair appointment (holy grey!) and I had a couple of pre-planned commitments to speak to two Girl Scout troops about the Peace Corps and my experience in Mozambique for their World Thinking Day. Oh and somewhere in there I had to sleep, cook, clean and do laundry. So needless to say exercise took a back seat for the first time in a very long time. It was a conscious decision to take the week off. I wish I could say that I was vigilant about eating light and healthy all week, but it seems as though hormones and stress took over. I overdid it here and there and felt just horrible. But it’s over. The week is done. The old me would have probably just ditched exercise all together and continued allowing more and more “treats” as snacks until clothing didn’t fit and I was right back to where I started. I’m happy to report that my clothing still fits, the scale didn’t beat me up and I started the week off with a 10 mile run on Sunday. Yesterday morning while Carlos was at school I ran 9 miles just because I felt like it. The morning was gorgeous and I had the time so I went with how my legs felt. They felt like running! I’ve been trying to get my race schedule set for the year, but some of the race registrations haven’t opened up yet. Last night I was finally able to register for my first international race. 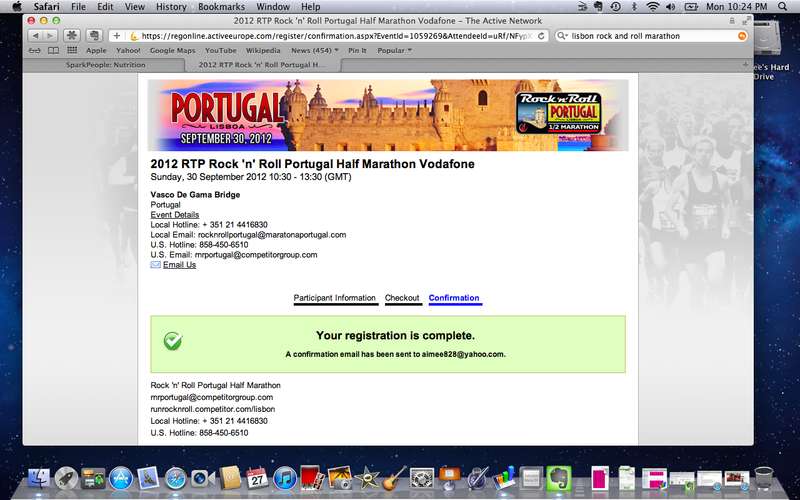 I will be running the Lisbon, Portugal Rock ‘n’ Roll Half Marathon on September 30, 2012!! Oddly enough my husband and I had decided on a vacation in Portugal in September. I love incorporating races into vacations. It’s a fun way to see a new place and usually the race environment is very family friendly. Now I just have to plan our trip! We are hoping to see as much of the small country as we can. My husband, of course, wants to see a soccer game. I don’t mind I actually like going to games. There will be some beach action and maybe a visit to a winery or two. Yes we are taking Carlos, but neither Orlando nor I are big drinkers. I just love visiting vineyards and trying a sip or two. They are usually beautiful places and often have good restaurants on site or nearby. If anyone reading this has ever been to Portugal please let me know what you enjoyed about your travels there. We would love recommendations on places to go, things to do and of course places to eat. I have a friend stationed in Portugal, and think it would be a really cool place to do. It should be fun Sam. Please let me know if your friend has any recommendations for things to do or places to see while we are there. Sounds like a great race to sign up for and with all the blogs I read, I only ever hear good things about the Rock n’ Roll races. I can’t wait to read all about the training and the race! As far as the taking a week off…sometimes we just need to do that because of life. And it sounds like you were pretty busy! That’s so cool that you go to the Girl Scouts and speak about the Peace Corps. I would love to hear about your experiences some day. And as Roni always says, what’s done is done…move on. I’m trying to live by that mantra now too. No one is perfect and we are all on a journey! I made it back to the gym for the first time in a LONG time yesterday and let me tell you, it was tough. Especially on the treadmill. I don’t know HOW you run so fast and for so long. I WANT to be a runner, but it’s so hard. Ran two stretches of five minutes each (at a 12 min/mile pace, 5.0 speed) and they felt like the longest five minutes of my life each time! My breathing was horrible, my legs felt like they weighed 100 pounds each, and every time I looked at the time I was like, “only 20 seconds went by!! !” But I kept going. The walking felt great after the running 🙂 I’m hoping as more weight comes off, the running will feel easier. I love Roni! I actually could hear her advice last week telling me that I did not get to this weight overnight and one week off isn’t the end of the world. This will be my first R ‘n’ R race. I’ve heard all good things about the R ‘n’ R races too. Congratulations on your running Kaye. I can totally relate to your experience. 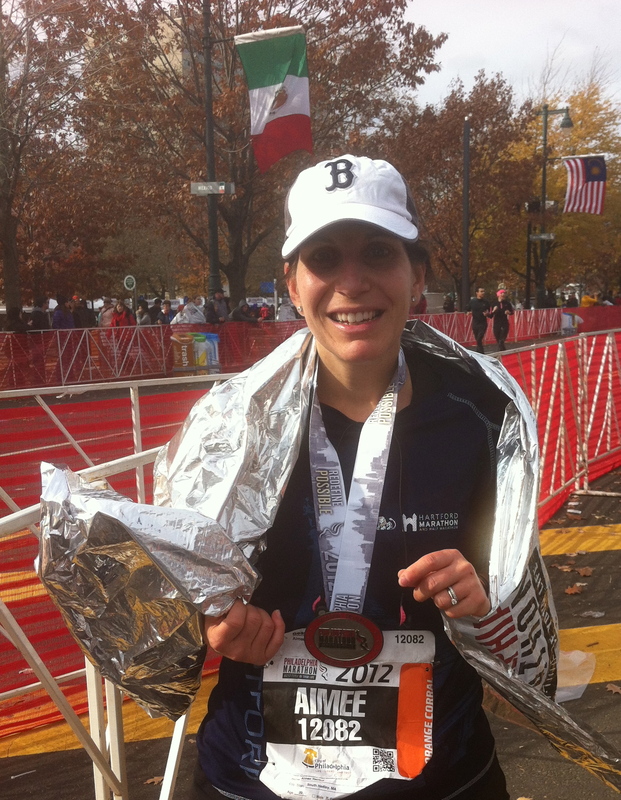 When I began running I honestly couldn’t imagine running for more than 30 seconds. My “run” was more of a really fast walk. I hated it, but I was convinced that it would get better. It did in time but I was running outdoors mostly. Then winter hit and I had to come to terms with the treadmill. I used to stare at the clock. It was painful. I hated every minute of it. Then I started doing intervals and playing all sorts of time games on the treadmill. I also set up special playlists on my iPod to help me get through the boredom and monotony of running on the treadmill. Now I don’t mind it so much. The treadmill and I have made nice. I also struggled with breathing so much in the beginning Kaye. I sound like I was going to die. It was ridiculous. Then someone advised me to spend the beginning of each run focusing on my breathing, forget about my speed and simply focus on the rhythm of my breathing. It helped a lot. Now I go out slow, get my breathing under control and then focus on my speed. My breathing isn’t much of an issue these days so it takes less time to control it. Running is a process. Once I allowed myself to relax and enjoy the process I learned to love it. Hang in there. I think it is great that you are incorporating races into vacations. What a great idea. Portugal is a beautiful place. Have never been, but would love to visit one day. As for the week off of training. It is good for your body to take a break every once and a while. You seem very disciplined so I am sure you won’t have any problems getting back into the swing of things, wish I could say the same. Enjoy your day! Whoa, so cool! I’ve never really gotten into running races, but I think I would definitely love to run one in another country!